A scoop a day keeps the poop at bay. Cats. Clean creatures with sensitive noses, they're finicky about many things, among them waste receptacles. Knowing how often to change the litter depends on a variety of factors, including the type of litter you use and the number of litter boxes and cats in your home. The Humane Society and other authorities say most cats prefer the fine grains of clumping litter due to its softer feel on the surface on a kitty's paw. Clumping litter allows you to scoop even urine out of the box, which helps to make litter last longer in the box. Avoid scented clumping litter, which can be bothersome to your cat, and opt instead for a sprinkling of baking soda to reduce odors. Traditional nonclumping clay litter typically has larger grains; however, some dust-free options have smaller grains. This type of litter really cuts down on the odor released by cat urine. No matter the type, it is better to stick with a litter your kitty likes rather than to experiment with others. Changing interval depends on what kind of litter you use. Scoop clumping litter at least once each day and make sure the box has about 2 inches of litter. Using this method, you'll need to dump all the litter and clean the box every two or three weeks. Clay litter does not need to fill the box as much as clumping litter; you can provide an inch of litter or less less. However, you'll need to dump and replace it once or twice a week depending on its usage. Regardless of the litter type, you must change it more often if there is a lot of wet clumping, if an odor persists or if your kitty goes to the bathroom elsewhere. Any sudden bathroom changes will warrant taking your cat to a veterinarian to determine if a medical condition exists, such as arthritis or a urinary tract infection. Neglecting to provide the appropriate amount of litter boxes for the number of cats you own will necessitate changing the litter more often. The Humane Society recommends having one more litter box than you have cats. Ideally, your kitty should have access to a box on every level of your home. 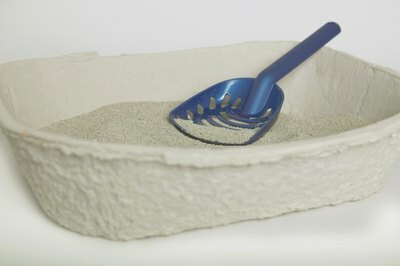 Remember that maintaining a clean litter box is for your cat's health and happiness. Wash the box thoroughly when you dump litter, to prevent urine and feces buildup. Scrub it using soap and warm water. Go ahead and sniff the box when it is dry; if you can smell remnants of the waste, chances are your cat will smell them better; she may avoid the litter box. Never use bleach, which is toxic to cats, nor products with ammonia or citrus oils. Make sure to leave at least one litter box available when cleaning the others so your cats are not left without a place to go in lieu of their loo.